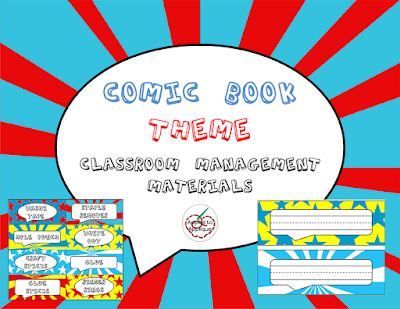 Introducing Comic Book Theme Classroom Management Materials! I am excited to be introducing a new theme for my classroom management and organizational products: Comic Book Theme! While I think this could be fun for any teacher, I especially thought of the men out there. Guys, there is just not enough stuff out there for you, especially when it comes to classroom themes. 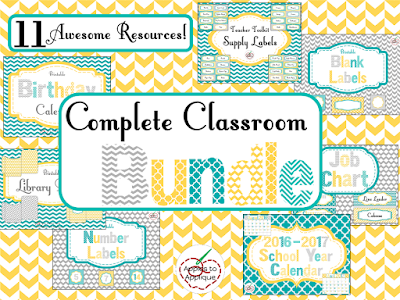 Currently I have teacher supply labels, printable name plates, and a classroom birthday calendar listed, with more products in the works. If there's something specific you'd like to see, leave me a comment or send me an e-mail and let me know! Make sure to follow Apples to Applique on Teachers Pay Teachers so you don't miss any new products! I know as we're right in the thick of summer, schoolwork is often the last thing on our minds! We're thinking about barbecues, and pool parties, and vacations, and summer treats like s'mores. I wanted to share this fun activity with you to keep your kiddos' minds sharp during the summer break, or to prepare for your school kiddos as they return next month--eek, that's coming up fast! I thought this would be such a cute idea, and once again, the talented Nicole at JolieDesigns created the beautiful clip art to help make my thoughts a reality. This activity makes a fun and simple math station, and works on number recognition in 4 forms: numeral, written word, tally marks, and ten-frames. Kids find the four pieces that go together (two graham cracker pieces, one chocolate, and one marshmallow) to complete their s'mores. This could also be used as a file folder game, or in small groups as a Go Fish style game. I would love to hear how you use it in your classroom! 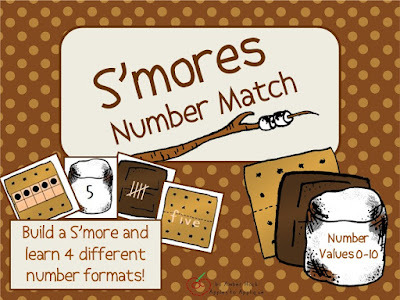 Buy S'mores Number Match Activity here! 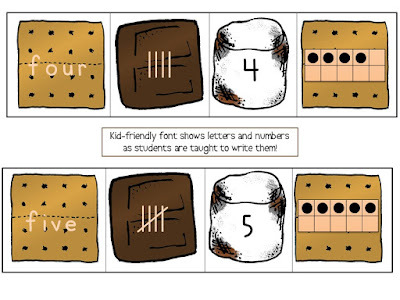 Have fun building your s'mores, and don't forget to follow me on Teachers Pay Teachers! Complete Classrom Bundle in My Most Popular Theme! I absolutely love this Yellow, Teal, and Gray theme for classroom organization and decor, and apparently lots of other teachers do, too! This theme is by far my biggest seller on Teachers Pay Teachers. If there's anything else you need to help organize your classroom, let me know, and I'd be happy to work with you! Lions and Tigers (No Bears), Oh My! 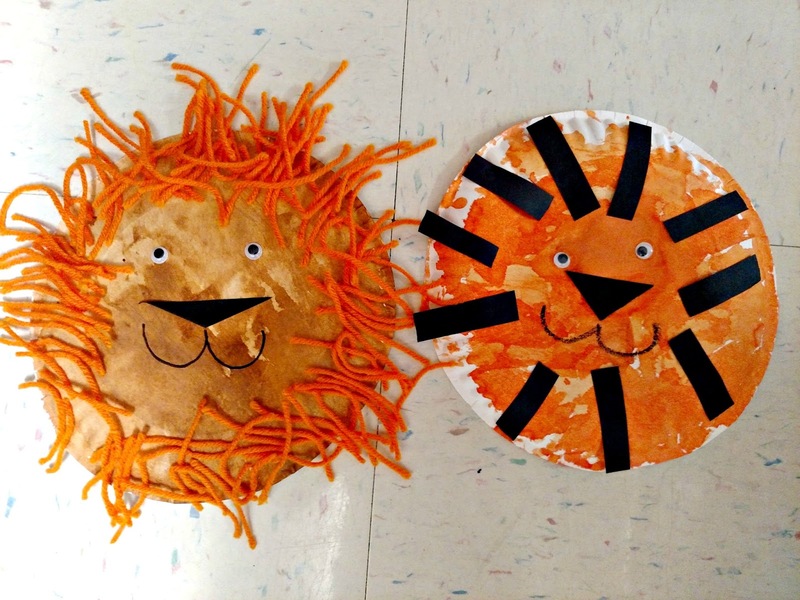 Recently we finished up a unit on wild animals; always a favorite with young children! We did some shared writing, listing wild animals on one side of the SmartBoard and pets on the other. The kids were very creative coming up with all kinds of different animals. One of my kiddos was excited to add "tapir" to the list of wild animals, saying it is his favorite animal. He knows all about it, where it lives, what it eats, etc. Keep in mind I teach Pre-K, so this is astounding! Another student was sad that we wouldn't add "dinosaur" to the list of pets. He insists he has a pet dinosaur. We also hesitated over adding that to wild animals, since dinosaurs aren't around anymore. After some confusion and discussion, we decided that we were really talking about animals we could likely see in a zoo, although that answer didn't really satisfy anyone. What did satisfy all of us was this darling craft! 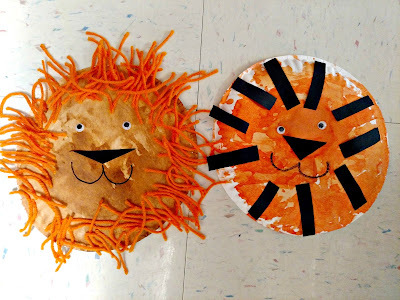 The kiddos got to choose between a lion and a tiger, which added some great oral language about colors and stripes and what on earth a "mane" is. One kid called it the lion's beard, and I liked that description. Kids have such a way of putting things. I am so excited to announce that I have the opportunity to travel to South Africa this summer! I am going on a trip called Women of Strength with the missions organization Amor. I will be working with women from all over the world to build homes and minister to children who have lost their parents to AIDS. I have taken 6 missions trips with Amor before, to Juarez Mexico, Puerto Peñasco Mexico, and the San Carlos Apache Reservation. I absolutely love working with Amor, because of their focus on providing sustainable change for the people they minister to. They partner with local churches in order to have the biggest impact possible. I've never gone somewhere as far away as Africa, and I'm excited and a little nervous. Because of airfare, this trip is significantly more expensive than my previous trips. I still have a long way to go with my fundraising, so I'm asking everyone to share this link and to please consider supporting me as I minister to the beautiful people of South Africa. At first, I felt guilty, like I was letting my readers down. Then, I started feeling some sweet freedom. I didn't have to post new content; no one was making me. And I had so many other things going on in my life. On top of the toddler and pregnancy thing, we had just moved 600 miles and two states, back to our home town, and both of us started new jobs. Soon, I stopped feeling guilty and even, *gasp*, forgot that I "should" be blogging. It brought some relief. I realized I had started to get very jaded with the whole blogging world. I had read every "how to grow your blog quickly" post and article by all the big bloggers out there, and yet my blog grew verrrrry slowly. I had originally envisioned gaining a community of readers organically, but soon learned that just doesn't happen in blogging, except for rarely. There are all these blogging groups where you leave comments on their new stuff and in return they'll leave comments on your new stuff, just to trick search engines and algorithms into thinking your blog is more popular than it really is...I was over it. It all seemed so fake. I was also tired of all the over-posting. As a small-time blogger, it was frustrating to hear that I should be posting every day or two, because I tried hard to provide new, original content with every post, and that takes time. I wasn't just copying recipes from other blogs, I was creating my own! Yet so many big bloggers are just copying the recipes of other bloggers (giving credit, of course) and posting it as new content on their own blog. How many posts does the internet really need about making the same batch of brownies? Millions, apparently. There's just so much of the same thing out there; it's hard to find DIY/cooking blogs with truly original content anymore. Everyone has mod podged a picture to a canvas, everyone has made some form of pumpkin bread, everyone has painted some piece of furniture a terrible color to give it "new life" (and very clearly date it, just like the avocado countertops of the 70s and blue floral wallpaper of the 90s, in ten or fifteen years people will find lime green dressers and bright pink end tables at thrift stores and say, "that's so 2016"). Then there are bloggers who really don't have new content, but they feel like they have to post every day, so they just spiff up their old content and repost it, or post a dozen things that are really the same...like a blog I saw once where they had about ten posts on how to make homemade play dough, all the same recipe, but each post had a different scent or color. You really need a separate post for those simple variations to the same recipe? So, after my unintentional break from blogging, I decided I was done. I have contemplated writing this post for about a year and a half, but just never felt like it. I have decided to keep my blog around, but change the direction of it. I'll update it every once in a while with stuff I've done in my classroom, or to share something cool I've just listed in my TPT store, but that will probably be the extent of it. There may be weeks or months between posts, and I'm okay with that, because finally, I'm just blogging for me.